Check available dates for 2018-2019. Hunt wild Texas quail in the beautiful Rolling Plains region of Texas on the 165,000 acre Pitchfork Ranch. Our quail numbers are excellent due to the outstanding habitat available in our area. The Pitchfork Ranch has the right mixture of weed growth, insects, cover, and range management necessary to consistently produce quality wild quail hunting. Quail are found over the entire ranch. Each group of hunters and their guide will have exclusive access to unpressured pastures that are typically 5000+ acres in size. You will not hunt "old" ground and will probably never see another quail hunter on the hunting property (except back at the lodge). We rotate quail hunting locations regularly to preserve the unpressured nature of our habitat. Lodging and meals are provided at the modest hunting lodge located on the ranch. Our hunting lodge is very well equipped with large community room, satellite TV, DSL wireless Internet, phone, full size refrigerator, pool table, and five bedrooms with private showers and bathrooms. We provide all linens, pillows, and towels. At the cookhouse our full time cook prepares all-you-can eat ranch style meals with plenty of homemade cherry, apple, pumpkin, and pecan pies plus a wide variety of cookies and snacks. Bring your appetite! Poor rains in late 2017 and 2018 have hurt the wild quail production. Current numbers are similar to 2014. Fall bird counts will tell the story but we expect numbers to be down. The Rolling Plains is one of the few areas left in the US that still holds a stable wild bobwhite quail population. The Pitchfork Ranch is one of the few ranches in the Rolling Plains area that consistently produces outstanding wild bobwhite quail habitat. Conservative livestock stocking rates and proper range management will assure the highest quality habitat for years to come. 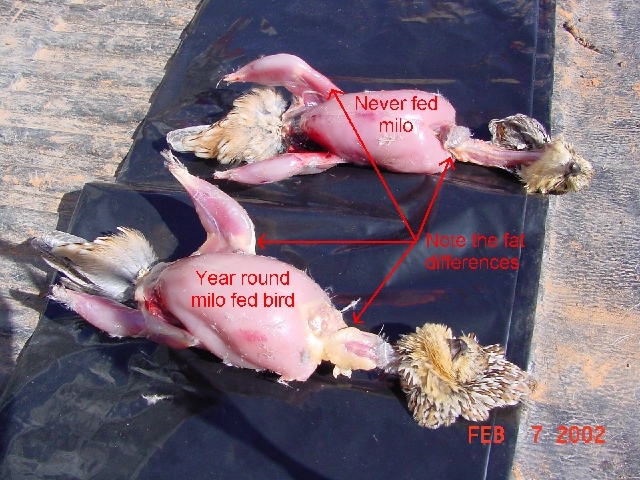 We provide our quail with year round supplemental milo and wheat feeding. The supplemental feeding program seems to make a significant difference in bird population during drought years. A photo taken February 2002 illustrates this difference. We do our best to make quail hunting the Pitchfork Ranch an experience to remember!! 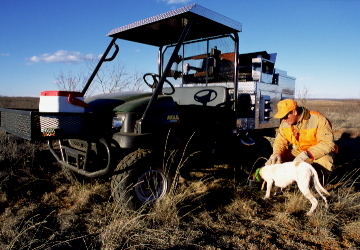 Hunt behind pointers in very scenic areas from one of our customized late model crew cab 4x4 hunting vehicles. We now offer guided hunts on a fully customized 4x4 Kawasaki Mule. We enjoy walk hunting as well. Regardless of your preferred hunting style you will enjoy your time spent on the Pitchfork Ranch. These are 100% wild birds! We do limit hunting and restrict bag limits during drought years. We will never over hunt our quail population. We provide certain shotgun shells at no additional charge. We stock #6 and #7 1/2 shells in 12 and 20 guages. Call ahead for shell availability if you are bringing 16 or 28 gauges since we no longer stock either. **All hunts except season leases require a guide. Typically three hunters per guide. Click here for Available Dates. Are you a single hunter looking for hunting partners? If so please visit our Singles page. Season: November through February Click here for Available Dates in 2018-2019. Please visit the Terms and Conditions page for a detailed description of additional services provided.